At Milli we believe that overconsumption in the Western economy led to unrealistic product use in the current society. Led by competitiveness, individualism and over consumption there is much room for change for the current ways of marketing, sales and product offers within this economy. For the future we foresee more emphasis on the aspect of sharing goods and products and thereby reinforcing the social aspect of product use. Moreover we are convinced that designing no longer entails products only but should be complemented with services in order to create the optimal experience that meets the customer needs. With our idealistic approach we believe competitiveness should be replaced by strategic partnerships between brands, consumers can become acquainted with sharing goods, which in its turn can reduce unnecessary overconsumption, and this will discourage individualism. So, what is the essence of the shared economy? What potential does the shared economy has to offer? In the shared economy service design plays a crucial role. An organization providing services for the consumers in the changing environment of the shared economy, achieves advantage through its ability to let the users interact with each other in a trustworthy, reliable and efficient way. The organisation should see itself as an integrator of complex business processes, in service of their users. As a service provider you have low control over the people, but high control over the objects and environment in which the people move. Therefore we see the users and producers as people in the system, interacting with intuitive and well-designed interfaces. for collaboration between systems. In order to find opportunities in strategic alliances between client companies and other brands we use the Milli Triangle. The Milli triangle captures the dynamic interaction between market, product and service for any given company. These cornerstones combine to a triangle that together represents the company of our client. This simplified model is very basic in order to provide a quick overview of the product , market and service for any given person involved in the workshop and to do this for other companies as well. The tool is designed for the client company to use in collaboration with the Milli design consultancy during the workshop session that will be organized in a full day programme. The one day sessions allows rapid decision making and therefore stimulating intuitive decision making. The triangle should be considered as a piece of a puzzle; as the triangle represents your company, where do you fit in with other companies concerning the product, market or service that you offer? By combining the puzzle pieces with different other companies represented as an element of the bigger puzzle a dynamic playfield evolves that opens up new opportunities. This results in unexpected strategic partnerships of which both companies benefit by complementing or reinforcing each other. In the defining phase the current service offered by the client will be mapped. This will primarily be done by the co-creation of a custom-made service blueprint, see references.This definition will create insights for all the participants of the workshop and most importantly it will ensure all parties are well aware of the company and it’s values. Since this is one of the easier phases for the client to define their own company it is also a very nice way to start up the workshop gradually. In the second step the triangle is introduced. The three corners of the mini Milli triangles represent the cornerstones of the company’s unique value proposition; market, product and service. At each corner we will search for brands and companies with an overlapping interest in this area, based on the following questions. During this phase we consider the environment to be mutable, change as an opportunity in which future perspectives guide our intuition. During the third step the recognized opportunities for collaborations are combined with the current service of the client by making holistic associations. The mini Milli triangles will be used as boundary objects to trigger the discussion. In this phase there will be an iteration between the custom-made service blueprint and the identified opportunities for collaborations. During this creative session new innovative collaborations will arise in a workshop between client and consultancy. 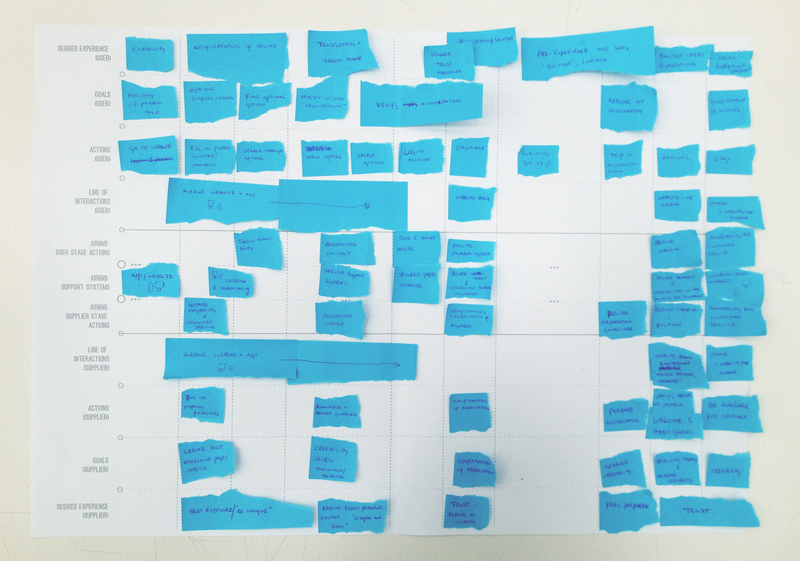 At Mili we use several service design tools to approach the design of a new- or redesign of an exciting service. 5 principles will lead to original and value adding services within the shared economy. Services are user centered, the service is experienced true the users eyes. Co-creation helps us to involve all stakeholders. Visualizing helps us to make the complex and intangible; simple and tangible. Prototyping tests our theories in the real world. An holistic and iterative approach in the above steps will lead to meaningful innovations. The theory sounds good, but how does it work in practise? Let us explain with an awesome case we have done . For this project Airbnb approached us. As Airbnb wants to broaden up their offer and extend their visibility during the journey of their clients, they were searching for possibilities to create an entertaining service. The following steps will guide you through this project. In the morning we started with the creative co-creation session at the creative space above the Highline in NYC. To get a grip on the project and gain insights in the service already offered, we tuned up some music and the blueprint was co-created. This blueprint led to insight on where Airbnb could offer even more or even better services to their customers. After a refreshing lunch with some veggies and fruits the blueprint was put aside. The Milli Triangle was introduced! With the help of the employees of Airbnb, possible brands and companies were recognized that shares overlap with Airbnb. These companies served a basis for the big puzzle. The most interesting companies got their own Mini Milli Triangle, these captured the value of the company in the three corners; market, product and service. The table discussion that followed became the big puzzle game. Combining services, products and markets with each other and showing the values that could be generated for both companies. From the table discussion a couple of interesting leads emerged. To see which could really add value to the wish to create an entertainment service, the blueprint was combined with all the promising leads. Within the blueprint a large opportunity already emerged; the moment between the confirmation of the reservation and the arrival at the destination. During this period the traveller has no contact with Airbnb but is longing for his vacation. A big opportunity for Airbnb lies here to let the traveller pre-experience the stay, excite them for the upcoming. Lonely planet could fill this gap in the service of Airbnb. By offering the traveller information about the area where he is going to stay he could already pre-experience the upcoming travel and get familiar with his destination. This is the first step in creating a new service offer that will both benefit Airbnb, the lonely planet and their users. The traveller will have a longer contact moment with Airbnb, a longer contact period leads to more time to leave a good impression. For the lonely planet even more exposure is created. The result: a beneficial strategic collaboration created by puzzling! From here, we were ready to grasp this opportunity and make it into a success story. Characteristics of design:  core metaphor is shape,  the environment is mutable in which  change is seen as radical, constant and an opportunity. As designers we use our  intuition where the  future guides the present. Our three phases; define, orientate and combine are based upon the three phases with an internal loop of the process described by Brown (20008). These phases are  inspiration,  ideation and  implementation. With the use of our tool we focus on the characteristics of the intuitive decision making process. This means making decisions rapidly, by using holistic associations and mental simulations. To solve the misalignment between intuition (Milli) and rationality (often the client) we first make them comfortable with intuitional decision making by mapping their own service and later on co-creating possible collaborations. The characteristic of professional designers:  focus on future solutions where reality and culture is something pliable,  willingness to work in an unknown and certain process,  preference for proposing novel, original forms that challenge the status quo. The service blueprint shows the front and back office of the client. 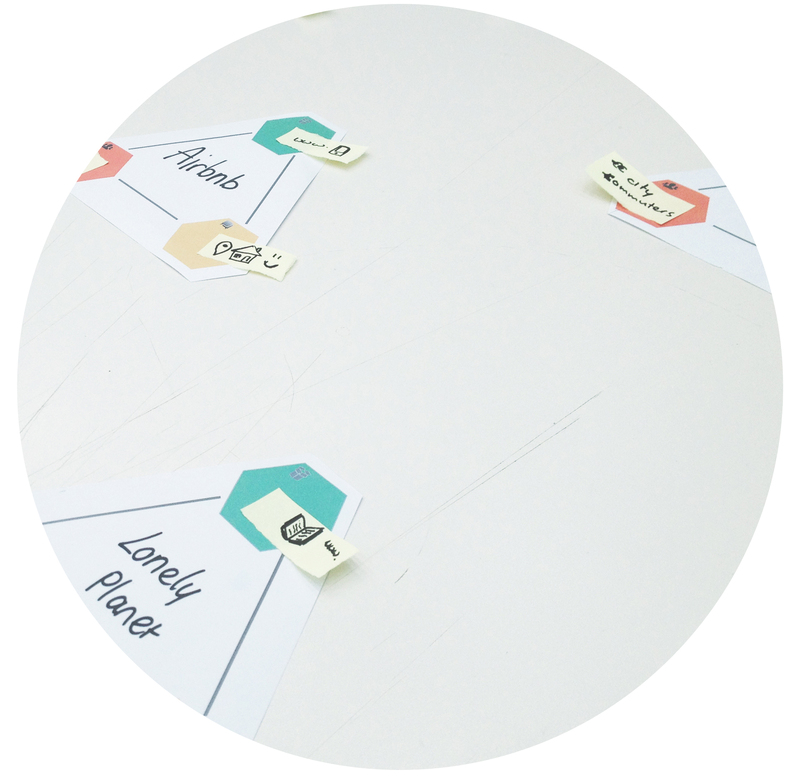 Though the blueprint is not really a tool for designers, we constructed our explorative process on the use of a designerly tool (the mini Milli triangle) that uses the service blueprint as identifying opportunities. The future of service design is still very unclear and unpredictable, therefore Millie takes control by offering visual and tangible tools to use the clients means to map their future. The service blueprint is based upon the theory described in the paper of Secomandi & Snelders (2011). Milli designs user-centered, which means; “the activities of designers is about satisfying user needs, by products that are easy, pleasant, or interesting to use. This is done with the help of co-creation.